Welcome to the RPG Maker Times blogsite. Version 6 has been moved to Dreamhost. This web host is highly recommended! It’s fast, secure and affordable! Anyway, the blog has a new, more dynamic layout. It was redesigned to reflect the changes to the blog itself. I’m updating the style sheets slowly so that I can focus more on content. Many pages have been (or are being) merged, deleted or revamped accordingly. While I don’t have the time to update earlier posts, new updates will still be posted, of course. These include upcoming games (notably for RMMV), projects or plugins of note. 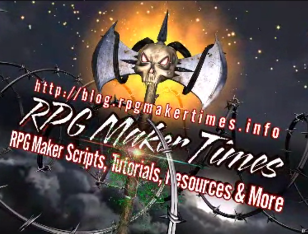 From February 13, 2014, the original Blogger RPG Maker Times blog and this one have merged. This is now the official blog for RPG Maker Times and will no longer be a "companion" site. The original RPG Maker Times blog at Blogger will remain, but it will be used mostly for updates that appear here.